Graphics intensive page. Please be patient while photos download. 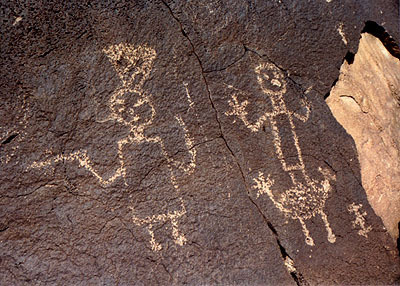 Over 17,000 petroglyphs are located on the seventeen mile long escarpment of West Mesa near the western bank of the Rio Grande in Albuquerque. 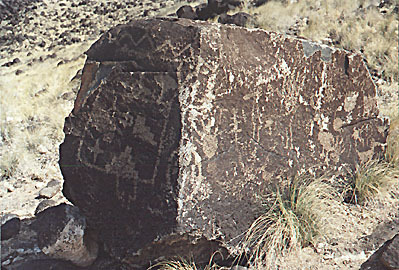 Most of this rock art was pecked or incised into the basaltic boulders between 1300 and 1680 A.D. 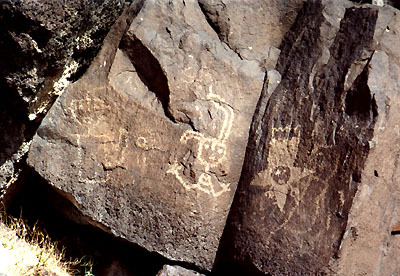 The figures include snakes, birds, star beings, shamans, clan markings, and other symbology both natural and spiritual . 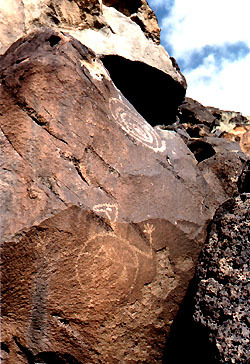 Inside square: star and terraced icons meaning "land," "mountain," "cloud," or "house"
Polly Schaafsma, Rock Art in New Mexico, Museum of New Mexico Press, Santa Fe, 1992. 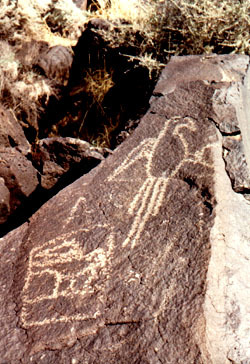 David Grant Noble, Ancient Ruins of the Southwest: An Archaeological Guide, Northland Publishing, Flagstaff, 1991. 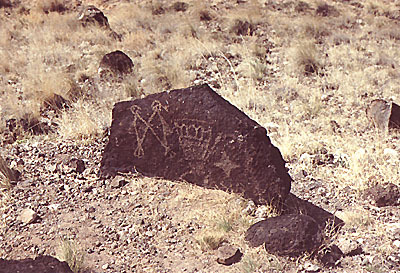 James R. Cunkle, Talking Pots: Deciphering the Symbols of a Prehistoric People, Golden West Publishers, Phoenix, 1996. Copyrighted © 2000-2001 by Gary A. David. All rights reserved.